Stephen William DeVries, son of Hans DeVries and Mary Lou (Kamerick) DeVries, was born on May 5, 1951, in Oskaloosa, Iowa. During his early childhood, the family lived in several towns in Iowa before settling in central Iowa. Steve attended public schools in Sigourney and Newton until he completed the eighth grade. Steve won a scholarship to attend Phillips Exeter Academy in Exeter, NH, where he completed high school, followed by a degree in civil engineering earned from Stanford University. 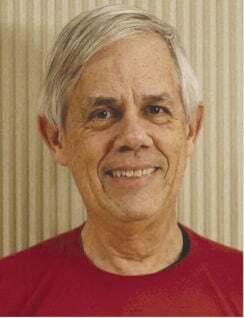 Steve was an avid bicyclist, photographer, railroad enthusiast, and amateur glacial geologist. In 2018, he and Pauline enjoyed a wonderful summer visiting their children and traveling throughout the United States. Steve also achieved a lifetime goal of bicycling Missouri’s Katy Trail end to end, without skipping a mile, before he and his wife moved to their forever home in Grinnell, Iowa. Steve is survived by his wife Pauline of Grinnell, Iowa, his son Aaron of Ypsilanti, Mich., his daughter Stephanie of New York, NY; his aunt Lena of Kaltenkirchen, Germany; his brother John (Lori) of Waterloo, Iowa, his brother Charles (Esther) of Bethesda, MD; and 23 nieces and nephews. He was preceded in death by his parents and his brother James of Herblay, France. Visitation will be held at 9:30 a.m. Friday, May 24, followed by a celebration of life service at 10:30 a.m. Both will be held at Caldwell Parrish in Urbandale, Iowa. A luncheon will follow the service at Creekside Church. In lieu of flowers, the family requests that donations be directed to the American Cancer Society and the Iowa Natural Heritage Foundation. Sunny. High 68F. Winds W at 5 to 10 mph. Partly cloudy. High 78F. Winds S at 15 to 25 mph.